Over the last decades, hydrogen peroxide (H2O2) and nitric oxide (NO) have emerged as critical signaling molecules in plants, controlling numerous developmental and stress-related responses. 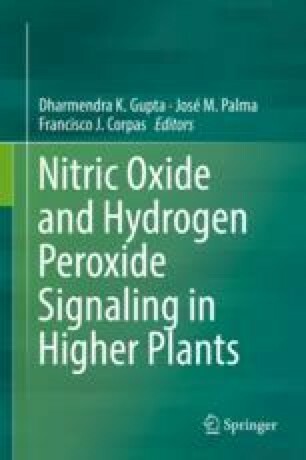 In this chapter, we discuss the current and potential biotechnological uses of these reactive molecules in agriculture, with particular emphasis on their involvement in regulating the postharvest shelf life and quality of the horticultural products as well as plant development and adaptation to environmental stresses. The multiple methods used to deliver H2O2 and NO to plants were compared in light of their effectiveness in controlling plant responses associated with desirable crop traits. As both H2O2 and NO levels in plant cells are regulated by multiple and overlapping routes of production, scavenging, and removal, numerous candidate genes have been selected for genetic manipulation in both model and crop species. The encouraging results obtained in most of these attempts to manipulate the endogenous levels of these reactive molecules in transgenic plants are presented and discussed, highlighting the enormous potential that adjusting H2O2/NO metabolism may have in further improving crop performance under both optimal and unfavorable environmental conditions. Work in the laboratories is supported by FAPESP (Sao Paulo State Foundation for Research Support, #2013/18056-2, #2016/01128-9 #2016/02033-1 and #2017/17935-3) and the Ministry of Economy and Competitiveness (Spain, AGL2015-65104-P).